In 1939, pulp magazine publisher Street and Smith decided that instead of advertising their magazines on newsstands, they would try something new: radio. In 1930, they sponsored a weekly show called the Detective Story Hour featuring adaptations of mystery stories from their magazine of the same name. The shows were first announced, then later narrated by a strange and shadowy figure named – appropriately – The Shadow. Much to Street and Smith’s amazement, it was the narrator that became more popular than the show. 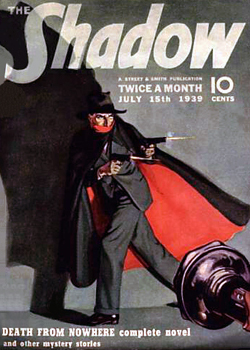 Audiences were requesting for “that Shadow Detective Magazine”. Walter B. Gibson was soon hired to write what would become one of the most successful pulp novel series in the 1930s and 1940s. In 1937, the fourth season of The Shadow radio show featured a 22-year-old actor named Orson Welles, who would later scare the country with his Mercury Theater radio adaptation of H. G. Well’s The War of The Worlds. He would leave the role in 1938 to pursue an acting and directing career.